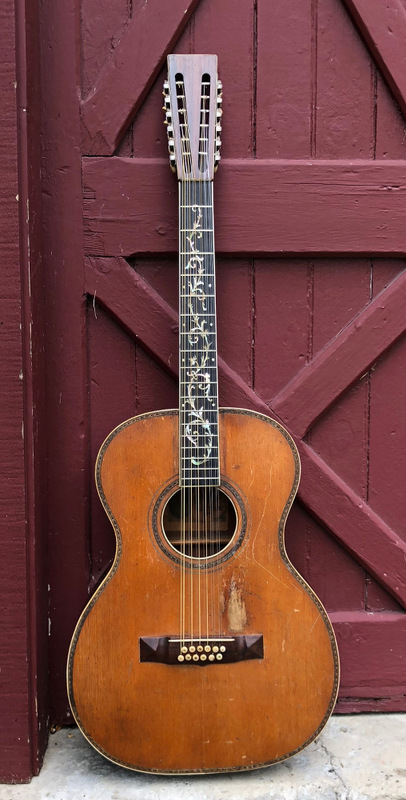 Oscar Schmidt 'Stella' 12-String Jumbo c 1925 | SOLD | We've studied, bought, sold and discussed hundreds of 'Stella' guitars over the years but have never seen an example from the venerable Schmidt factory like this one. 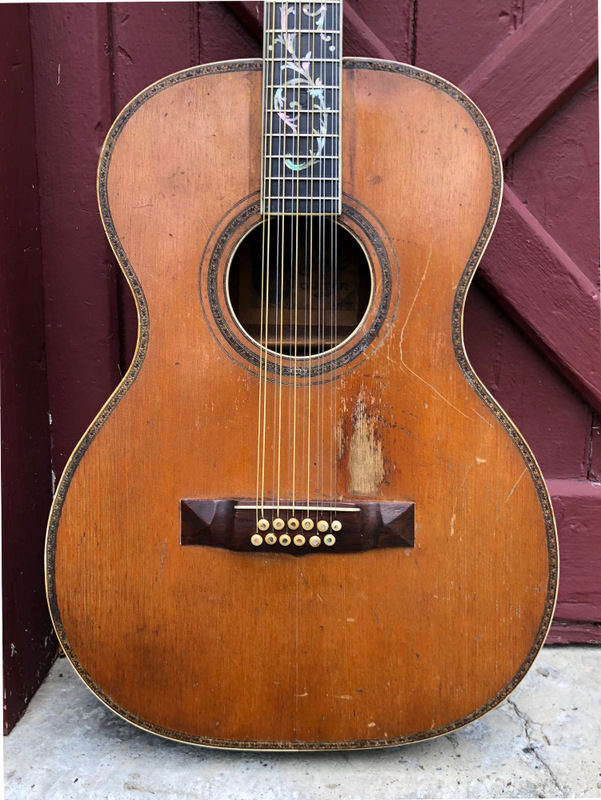 Thanks to the genius of Leadbelly and Blind Willie McTell, the Stella jumbo 12 ranks among the iconic vintage guitars, highly sought for the 'sound' and rarer than a Martin D-45! This example likely dates to the twenties, and is a the top-of-the-line Stella offering. 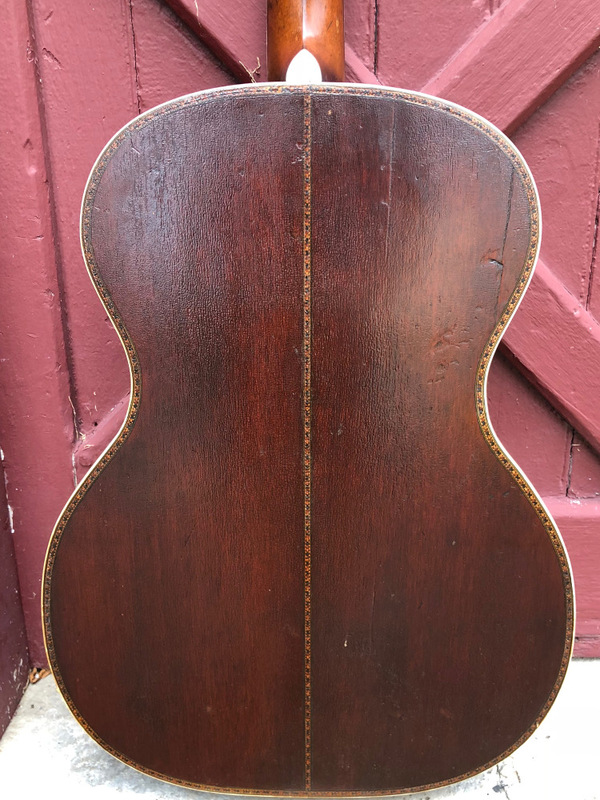 The body is mahogany, with a spruce top. 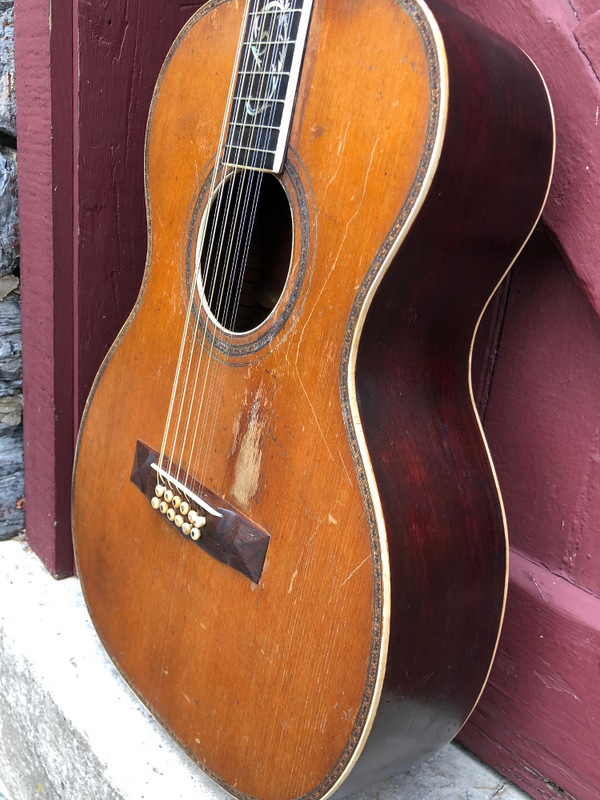 The top and sound hole are bound in the so-called 'Leadbelly' purfling, which matches his iconic Stella. White celluloid binds the top, back, neck and peg head. The peg head sports a Brazilian overlay. 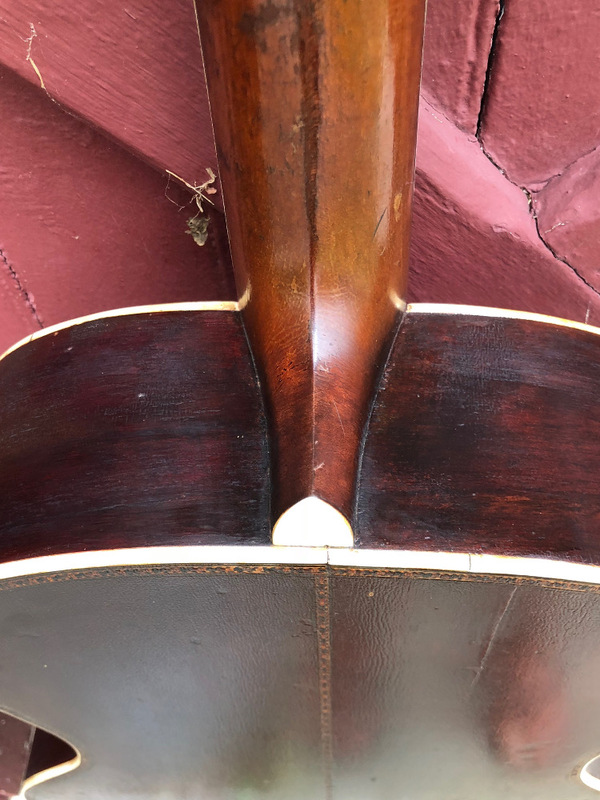 The Brazilian bridge is likely original and sports the fancy 'point' on the lower edge which is often found on the better OS 12s. The fingerboard is ebony and topped off with the OS 'tree or vine of life' inlay (the eight little dots are a later addition which we chose to keep). 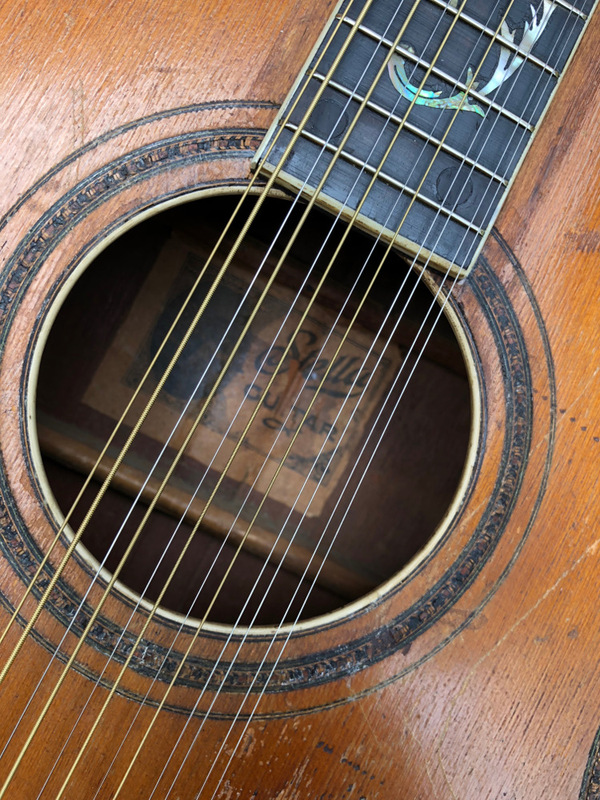 A worn but intact 'Stella' label is visible inside and according to Neil Harpe's Stella Guitars book, is the earliest of the Stella labels extant. To our knowledge, this is the only jumbo 12 to emerge sporting the fancy vine inlay. We've sold/seen a number of concert-size Stellas and one jumbo 6 with this inlay, but never a 12. 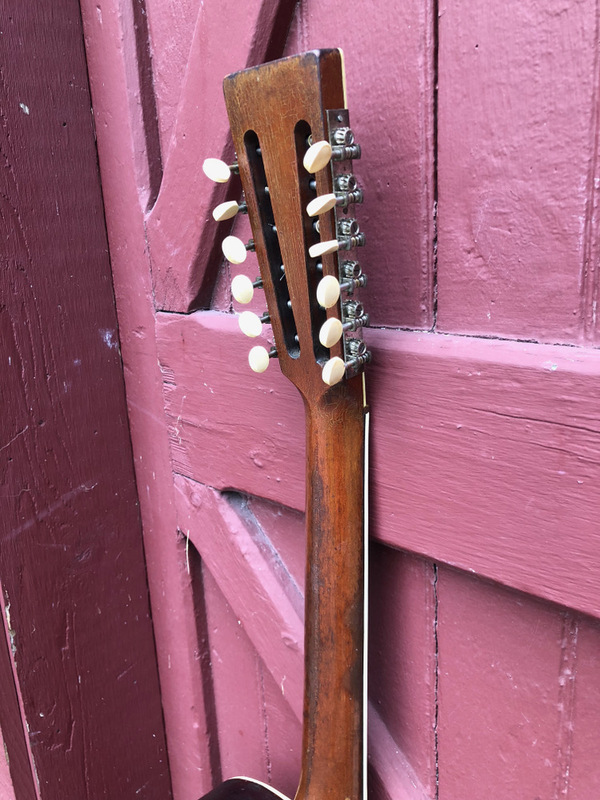 The bridge, tuners and likely some of the bridge pins all appear original to the guitar. There are some old repairs. A crack radiating from the upper bout, bass side, through the heel and continuing on the treble bout side. Internally, this was reinforced with cleats or wood strips. Externally, the repair is nearly invisible. Two top cracks parallel to the fingerboard extension were repaired and reinforced underneath with a sturdy brace. The neck was reset. Some back-to-side kerfing appears replaced. Some back cracks were glued as well as a few braces. The finish appears intact but for the area of repair on the upper bouts/heel. Overall, there are various nicks, dings, scratches and play/use wear, but solid with good bones! The auditorium-size body measures 15 5/8" across at the lower bout. Scale length is 26 1/4". The fingerboard measures 1 15/16" across at the nut, and string spacing is 2 5/16" across at the saddle. The neck is carved in a 'V', fills the palm but is not 'clubby'. Action is very comfortable and the guitar plays well. 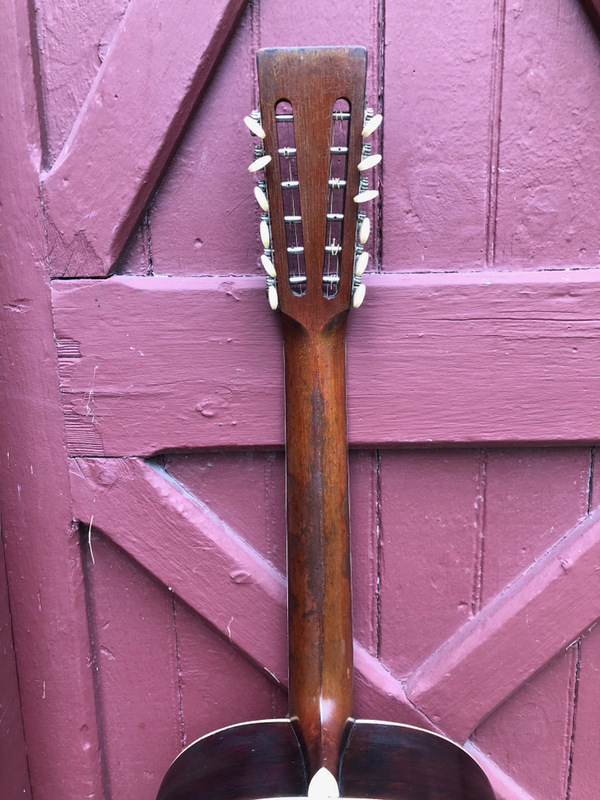 Considering the small sample size, this jumbo 12 ranks among the best sounding .. it chimes sweet and clear with a McTell ring, but can produce a full Leadbelly growl when pushed. A great blues guitar, and perfect for the player seeking the sounds on the old 78s. If guitars were people we'd guess this one was a pirate. It has it's share of scars, looks gnarly but jaunty, and tends to snarl when provoked. Comes with a newer Gibson hard case.